Racist abuse at Celtic Park aimed at Kilmarnock FC players was reported by various sources (31st October 2009). Celtics No.1 fan group the Green Brigade has released a statement (2nd November 2009) confirming this. "For the past two seasons we have had to put up with continual ticket checks (even though the club, senior stewards and stewards in the area know who our members are and that we have valid tickets for the section) and general harassment, most notably having banners ripped down. We are aware that, like ourselves, the club are not happy with overcrowding in the area. We have tried to discourage people from doubling up at seats and standing in the aisles, through threads on our online forum and by speaking to people at matches. We’ve been informed that after we left yesterday our section was soon filled by fans who don’t have tickets for the section and who reportedly sang sectarian songs and made audible racist remarks. 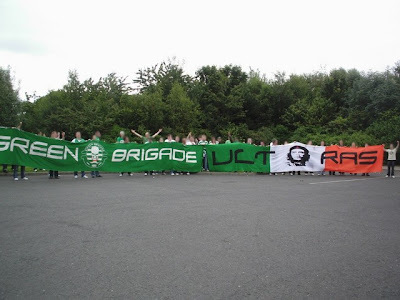 As a group with an anti-racist and anti-sectarian stance we find it strange that we encounter regular harassment from stewards and police while these 'rules' clearly do not apply to others."